It takes weeks if not months of interactions for a team to really come together and collaborate well. So when we put a group of people who don’t collaborate on a regular basis into a workshop and expect them to solve an important problem in a day or two, that group is unlikely to be operating at their collective best. But since we know this even before going into the workshop, we as facilitators can accelerate the group’s ability to collaborate openly and freely through different exercises. Working Agreements is a popular exercise that helps groups but it alone won’t get the group there because the participants are either not aware of potential style differences or they’re not comfortable in holding each other accountable that early in the workshop. 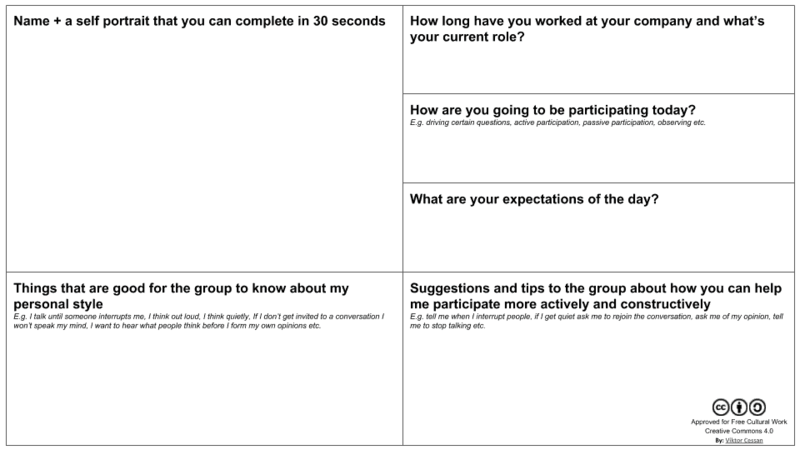 To address this, I’ve created an exercise I call the Workshop Collaboration Canvas that I use at the beginning of workshops and offsites when the participants do not collaborate on a day-to-day basis. 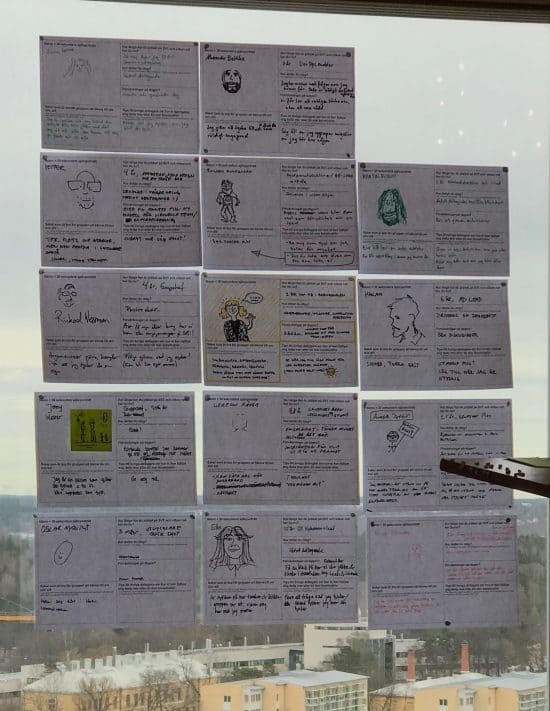 The Workshop Collaboration Canvas first engages the participants in introspection about personal expectations, goals, mood, and style preferences. It then creates a safe space in which the workshop group can explore differences in styles. Lastly, participants give each other explicit permission to call out unconstructive behaviors which in turn raises participants’ comfort level to do so. I’ve run this exercise in large group settings with up to 20 people and with subgroups of 4-6 people. In a large group setting, the exercise takes 30-40 minutes. In a subgroup setting, it takes 20 minutes and includes an optional bonus step (under step 5 below). Thinking about whether to run this in a large or subgroup setting? If you’re going to break into subgroups at some point during the workshop, consider doing so at the beginning of the day (or at some point before this exercise). This will allow the smaller working groups to strengthen their collaboration from the start. Share the purpose of the exercise (to improve the group’s ability to collaborate) with participants. Hand out printed blank canvases and a variety of colored pencils or markers to all participants. State out loud that participants shouldn’t feel obligated to share more than what they’re comfortable sharing. Give everyone 4 minutes to fill out their canvases. Have participants share their entire canvas one by one in 1-2 minutes each. Once everyone has shared their canvas, have participants put their canvases up on a wall. This will help serve as a visual reminder of the group’s desire to collaborate more openly and freely. If time permits, you can even have a quick gallery walk (which is particularly helpful if you broke into subgroups earlier). Put your spin on it and take it even further! What’s at stake for you here? How important is this topic for you on a scale from 1-5, and why? What behaviors/styles do you find provocative and how do you suggest you work around that? I’d love to hear about your experiences using the canvas (and any improvements you’ve made!). Leave a comment below or send me an email at viktor@cessan.se. Will defenitely try this at our next workshop. Thanks for the tips!